New York has become the first U.S. state to make tuition free for students from middle class families at public colleges that are two- and four-year. In January, New York’s Governor Andrew Cuomo introduced his plan of tuition-free. Lawmakers agreed to make it part of the state’s budget, which gained approval on Saturday by the Assembly and late Sunday night by the state’s Senate. It is expected that the governor will sign the budget legislation. Tuition will become free for New York residents who earn up to a certain income cap that will be phased in during the first three years. Beginning in the fall, undergraduate college students attending a State University of New York or a City University of New York will become eligible for an Excelsior Scholarship if the family earns less than $100,000 per year. The cap for income will increase in 2018 to $110,000 and in 2018 will be set at $125,000. Those who are eligible will not pay for tuition, which has an annual cost of $6,470 for four year schools and just $4,350 at community colleges. However, they will have to pay for room and board and fees. Those additional expenses could reach as much as $14,000 per year. Students have to take a minimum of 30 credits per year to be eligible for the scholarship. Some New York lawmakers spoke out against the requirement, because it excludes those students who are enrolled just part time. In the legislation’s final proposal the Governor said the requirement for credits was flexible so that any college or university student that faces hardship could pause and then restart the program as well as take less credits one semester and more another. After graduation, students who are given the scholarship must then remain living and working in New York for a minimum of the same number of years they had been given the funding. If they do not stay in the state, the scholarship is immediately converted to a loan. The requirement was not part of the initial proposal by the governor. 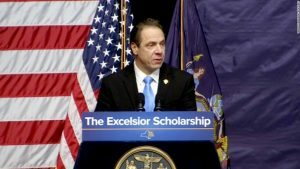 The Governor’s office estimated that the scholarship would cost over $163 million in year one, but some New York lawmakers said that figure was low. It is estimated that 200,000 students would become eligible for the program when it was completely implemented. This scholarship has been structured to help fill a gap after taking into account other state and federal grants. Close to half of the students who are full time at SUNY and over 60% of those attending CUNY, already are not paying any tuition because of federal need-based Pell Grants and or Tuition Assistance grants from the state of New York.